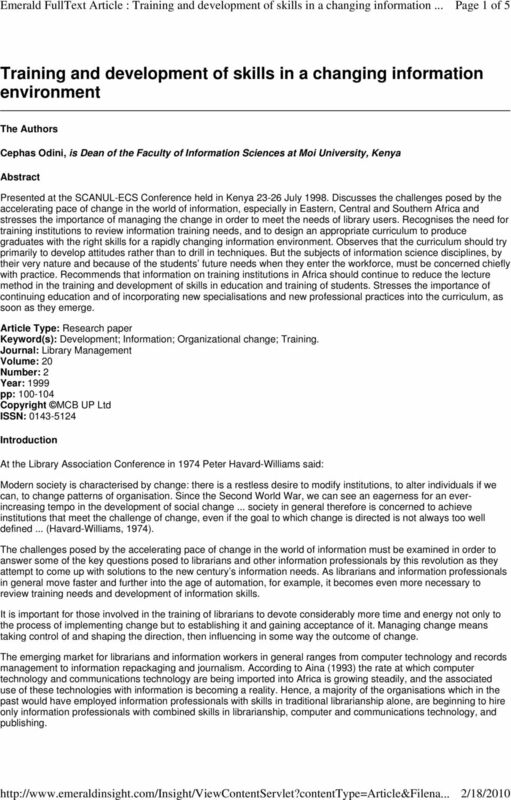 Download "Training and development of skills in a changing information environment"
1 Page 1 of 5 Training and development of skills in a changing information environment The Authors Cephas Odini, is Dean of the Faculty of Information Sciences at Moi University, Kenya Abstract Presented at the SCANUL-ECS Conference held in Kenya July Discusses the challenges posed by the accelerating pace of change in the world of information, especially in Eastern, Central and Southern Africa and stresses the importance of managing the change in order to meet the needs of library users. Recognises the need for training institutions to review information training needs, and to design an appropriate curriculum to produce graduates with the right skills for a rapidly changing information environment. Observes that the curriculum should try primarily to develop attitudes rather than to drill in techniques. But the subjects of information science disciplines, by their very nature and because of the students future needs when they enter the workforce, must be concerned chiefly with practice. Recommends that information on training institutions in Africa should continue to reduce the lecture method in the training and development of skills in education and training of students. Stresses the importance of continuing education and of incorporating new specialisations and new professional practices into the curriculum, as soon as they emerge. Article Type: Research paper Keyword(s): Development; Information; Organizational change; Training. Journal: Library Management Volume: 20 Number: 2 Year: 1999 pp: Copyright MCB UP Ltd ISSN: Introduction At the Library Association Conference in 1974 Peter Havard-Williams said: Modern society is characterised by change: there is a restless desire to modify institutions, to alter individuals if we can, to change patterns of organisation. Since the Second World War, we can see an eagerness for an everincreasing tempo in the development of social change... society in general therefore is concerned to achieve institutions that meet the challenge of change, even if the goal to which change is directed is not always too well defined... (Havard-Williams, 1974). The challenges posed by the accelerating pace of change in the world of information must be examined in order to answer some of the key questions posed to librarians and other information professionals by this revolution as they attempt to come up with solutions to the new century s information needs. As librarians and information professionals in general move faster and further into the age of automation, for example, it becomes even more necessary to review training needs and development of information skills. It is important for those involved in the training of librarians to devote considerably more time and energy not only to the process of implementing change but to establishing it and gaining acceptance of it. Managing change means taking control of and shaping the direction, then influencing in some way the outcome of change. The emerging market for librarians and information workers in general ranges from computer technology and records management to information repackaging and journalism. According to Aina (1993) the rate at which computer technology and communications technology are being imported into Africa is growing steadily, and the associated use of these technologies with information is becoming a reality. Hence, a majority of the organisations which in the past would have employed information professionals with skills in traditional librarianship alone, are beginning to hire only information professionals with combined skills in librarianship, computer and communications technology, and publishing. 2 Page 2 of 5 Rosenberg (1989) conducted a study in Kenya which revealed that out of the 191 vacancies advertised in the national newspapers in two years, 60 per cent were outside traditional library work, and required skills in editorial and publishing work, information technology and records management. Training needs The changing information environment requires a workforce which is familiar with the emerging information and communication technologies (ICT) on which the brave new world of information will depend. Librarians must arm themselves with the necessary skills in the use of various software packages, the Internet, CD-ROMs and of course traditional printed resources. The workforce should possess the personality and competence to marry traditional and ICT services to deliver the library service of the new millennium. The best education and training and the most effective management structures must support them. In order to meet the information needs of present-day users, the library personnel should be made acquainted with the latest developments in the field of information service and information science. In this context, training institutions have to play a vital role in designing their curriculum to the required education and training at the appropriate level. The challenges of developing an appropriate curriculum A major drawback in the design of information science curricula in many African countries is the depressing influence of the present status of information systems and the lack of a clearly defined national information policy. However, the principal challenges of teaching the information sciences are perhaps derived from the newness and the interdisciplinary character of the task. Several factors are forcing information handling institutions out of their manual pre-mechanisation stages, and onward to the beginning of the intellectual revolution. These factors include the rapid growth of all kinds of informational materials, the rapid increase in the necessity for access to the subject matter of these materials and the difficulty of obtaining people to accomplish the work. 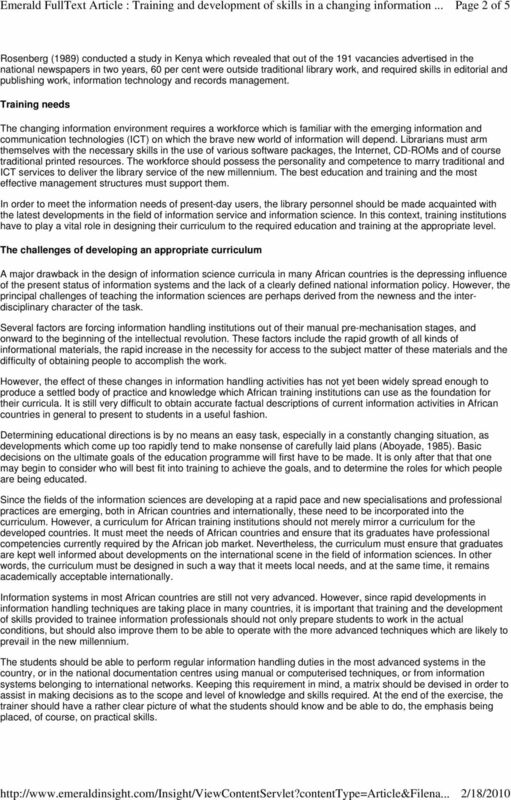 However, the effect of these changes in information handling activities has not yet been widely spread enough to produce a settled body of practice and knowledge which African training institutions can use as the foundation for their curricula. It is still very difficult to obtain accurate factual descriptions of current information activities in African countries in general to present to students in a useful fashion. Determining educational directions is by no means an easy task, especially in a constantly changing situation, as developments which come up too rapidly tend to make nonsense of carefully laid plans (Aboyade, 1985). Basic decisions on the ultimate goals of the education programme will first have to be made. It is only after that that one may begin to consider who will best fit into training to achieve the goals, and to determine the roles for which people are being educated. Since the fields of the information sciences are developing at a rapid pace and new specialisations and professional practices are emerging, both in African countries and internationally, these need to be incorporated into the curriculum. However, a curriculum for African training institutions should not merely mirror a curriculum for the developed countries. It must meet the needs of African countries and ensure that its graduates have professional competencies currently required by the African job market. Nevertheless, the curriculum must ensure that graduates are kept well informed about developments on the international scene in the field of information sciences. In other words, the curriculum must be designed in such a way that it meets local needs, and at the same time, it remains academically acceptable internationally. Information systems in most African countries are still not very advanced. However, since rapid developments in information handling techniques are taking place in many countries, it is important that training and the development of skills provided to trainee information professionals should not only prepare students to work in the actual conditions, but should also improve them to be able to operate with the more advanced techniques which are likely to prevail in the new millennium. The students should be able to perform regular information handling duties in the most advanced systems in the country, or in the national documentation centres using manual or computerised techniques, or from information systems belonging to international networks. Keeping this requirement in mind, a matrix should be devised in order to assist in making decisions as to the scope and level of knowledge and skills required. At the end of the exercise, the trainer should have a rather clear picture of what the students should know and be able to do, the emphasis being placed, of course, on practical skills. 3 Page 3 of 5 The curriculum should try primarily to develop attitudes, rather than to drill students in techniques. But the sub-fields within the information science disciplines, by their very nature and because of the students future needs when they go out to work, must be concerned chiefly with practice. Principles must form the basis of the course but a lot of practice must be included. Only if he or she knows information handling practices in some detail, can the student develop any intelligent attitude toward that practice. Teaching methodology The teaching of the information sciences in training institutions should start with a minimum of theoretical explanations so that the students get an overall picture of the whole matter and understand what will be done later on. Students should then pass through a stage where they manipulate and use the information handling facilities until they reach an acceptable level of performance, judged from an operational point of view, that is, not in terms of academic progress but in terms of quality of products as they could be assessed within an operation unit. The teaching of the information sciences should be well adapted to the use of all forms of audio-visual materials. The trainers or teachers should specialise in this method of presentation by building up files of charts, graphs, and extensive collections of transparencies for use with an overhead projector in the classroom. The most popular grouping of methods is a combination of lectures, seminars, laboratory practicals, written assignments and visits. The lecture method predominates among the teaching methods used in many information science schools, although the better the school the fewer the lectures, and the greater the use of other methods. The lecture method has the disadvantage of creating a passive attitude on the part of the student. Moreover, the student forgets a large part of what he or she hears and further, because of various barriers in the communication process itself never receives full comprehension of the material presented. Despite the criticisms often levelled against the method, in the hands of a capable teacher, the lecture method is one of the most efficient plans for presenting general principles to a large group of students in a limited amount of time. It also makes it possible for the trainer to provide a comprehensive outline needed by the student as a basis for building on his or her knowledge through the use of individual reading, research, seminar activity and advanced problem solving. It is hoped that information training institutions in Eastern, Central and Southern Africa will continue to reduce the lecture method in the training and development of skills in the education and training of students. However, the lack of sufficient teaching facilities to enable trainers to organise frequent effective work in small groups means the lecture method will continue to play an important instructional role in many training institutions for the lack of a satisfactory alternative. Nevertheless, this speaker believes that straight lecturing is not the best method to teach information sciences and recommends that it should as far as possible be combined with other techniques. As far as written assignments are concerned, the chief value for the method is the experience the student acquires in self-directed study. Students should be asked to write short papers on assigned information science topics and also to visit and carry out surveys and write reports on the existing information systems of various organisations, especially the most modern ones in their countries. It is important to realise that the value to the student in the preparation of papers is in direct proportion to the time the trainer takes to evaluate the work. If a student is to grow from the experience, the paper should be returned to him with sufficiently detailed criticisms to indicate how it might have been improved. As for the seminar method, again the reins are in the hands of the trainer, since the extent of the profitable use of the method is directly related to his or her skills in leading discussions. In practical skills teaching, teaching methods should naturally be adapted to provide for the amount of demonstration and practical application which the exercises require. Continuing education needs In order to maintain job effectiveness in a changing information environment and to meet the demands put upon them by the society, information professionals need to continue to learn, up-date and refresh their knowledge. Individuals need to learn new knowledge to prevent the onset of professional alienation in his or her performance and to adjust to the culture and changes prevalent in a new information environment. 5 Page 5 of 5 Havard-Williams, P. (1974), "The future of library qualifications and the public library experience", Proceedings of the Public Libraries Conference, Library Association, London, pp Huttemann, L. (1995), Continuing Education Programmes for Library and Information Personnel in Educational Institutions, Deutsche Stiftung für Internationale Entwicklung, Bonn,. Misco, B.S. 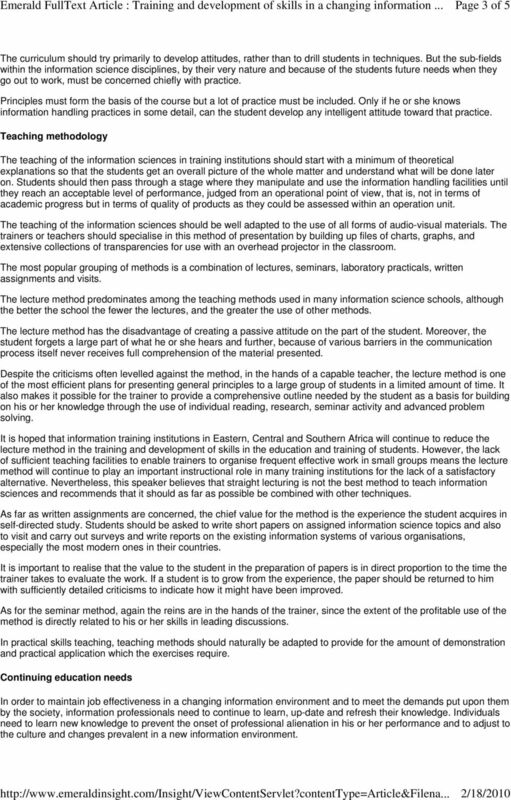 (1995), "Competencies for the information professional in the coming decade: a Delphi study", unpublished MPhil Thesis,. 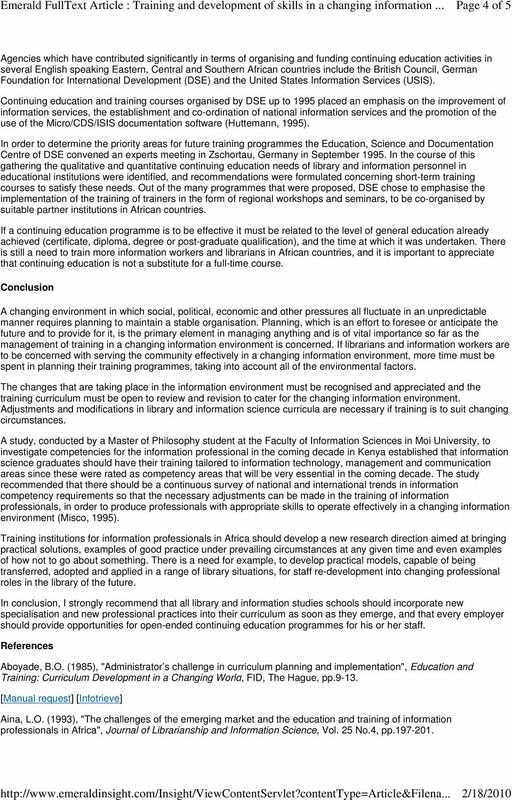 Rosenberg, D. (1989), Survey of the Skills and Training Needs of Information Professionals in Kenya, Moi University, Eldoret,. ICT in Malaysian Schools: Policy and Strategies By Chan, Foong-Mae (Educational Technology Division, Ministry of Education, Malaysia) Background Malaysia implemented the first computer system in 1966. This paper provides and historical overview of LIS education in Zimbabwe and how the teaching of information ethics is carried out.